With the arrival of summer, we tend to forget some important routines in our daily training. How can we restart those good habits after vacations? We spend an entire year exercising hard to show off our slender bodies during the summer season. When the season arrives, it’s normal for us to be ready to enjoy the sun and beach. With so much enjoyment, we forget the gym, but soon it’ll be time to get back to our workout routine. In reality, we must reconsider our objectives for the autumn season. Keep in mind that while we’re on vacation, our bodies are almost always subject to dehydration and a poor diet. Moreover, many times, a vacation equates to a prolonged period of little or no training. That’s why, at first, we should see exercise as a return to our demanding physical activity. There will be momentary goals that we’ll have to complete before returning to our usual rhythm. 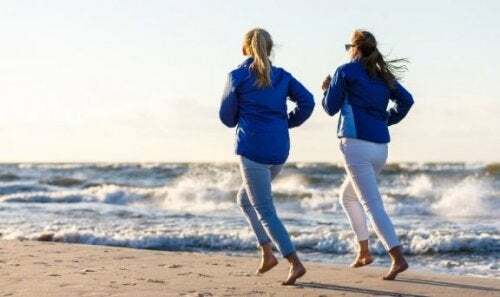 Restart physical activity: after a time of neglect, it’s normal for your body to not be able to assume the same challenges. You may lose resistance or the ability to lift certain weights. The best option is to activate muscle memory gradually. Lose weight: one of the priorities after summer is to lose the extra pounds. They were gained by consuming alcohol, junk food and by the lack of exercise. Before building muscle, we must balance our weight. Aerobic exercises will be necessary. Readapting: by changing your diet and lifestyle, your body and strength change as well. Therefore, exercising will be important to return to the correct nutritional order. Sometimes, your body might feel heavy, you may have a lack of energy or even digestive problems. It’s a mistake to try and get back to your workout routine as if nothing has happened. Strength and endurance are abilities that we work on and when we stop stimulating them, they diminish. The idea is to resume the activity at a slightly lower level than when we routinely exercised. It’s not a matter of starting from scratch. The previous training and muscle memory will allow us to restart from an advanced level. So, if we were able to lift 180 pounds with our legs or back before, maybe now, we can only lift 160 pounds. This slight set back is normal; respecting it will be useful to avoid injuries. It can be dangerous to exceed our body’s limits after a long period of not demanding it physically. Soon you’ll get back to your workout routine and return to your full capabilities. It’s well known in gyms that, sometimes, a good rest promotes muscle growth. This is much more noticeable in thin people, but it can apply to all types of bodies. Getting back to your workout routine after the summer can be difficult, but it has its advantages. After rehydrating properly, we’ll have more energy and desire to condition ourselves. At this point, we must take advantage of the extra motivation that often takes hold of us. By not placing any demands on your body for a time, any routine will be arduous and will generate muscle dividends. The muscular system is no longer used to resisting; hence, we’ll experience the effects quickly. Start with a circuit: on the first day you return to training, work out your entire body. The routines for the back, legs, and chest are fundamental. A good option will be to make short sets of various exercises and different muscles that include the whole body. Large muscles are a priority: when we start a targeted training routine, it’s good to begin with the legs and back. This will help us activate the rest of the muscles. Remember that when we’re working the most important muscles, we also make an impact on the smallest ones. Try something different: if there’s a training system that you haven’t tried before, it’s time to go for it. After about three sessions, you’ll be able to experiment and have the stamina to do it. Don’t forget the cardio: using the treadmill or the stationary bike will help you to lose weight. At first, you could avoid exceeding 20 minutes. Whatever you can endure will be an excellent starting point. Finally, after the first three sessions, you’ll be ready to return to your training routine. With less weight, intensity, and time lapses, but under the same regime. If you maintain discipline, two or three weeks will be enough to get back on top.